The NVIDIA® Jetson AGX Xavier™ module delivers up to 32 TOPS of accelerated computing capability in a compact form factor consuming under 30 watts. This gives you more than 20X the performance and 10X the energy efficiency of its predecessor, the NVIDIA Jetson™ TX2. This advanced system-on-module is powered by the NVIDIA Xavier SoC and designed specifically, for autonomous machines. Heterogeneous accelerated computing architecture delivers advanced edge capabilities. Plus, it comes with integrated memory, storage, power management, and an innovative thermal design to enable faster time to market. Run modern AI workloads and solve problems in areas like manufacturing, logistics, retail, service, agriculture, smart cities, and healthcare. 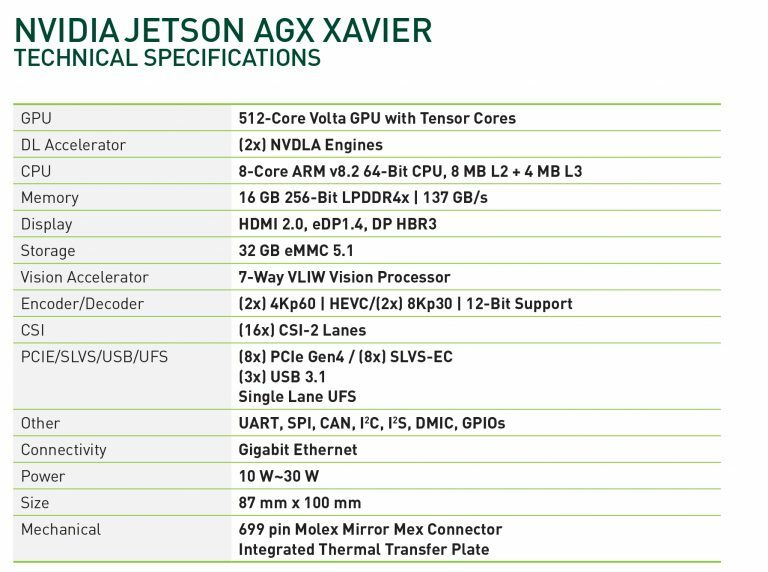 Jetson AGX Xavier is supported by NVIDIA JetPack, which includes board support package (BSP), Ubuntu Linux OS, NVIDIA CUDA®, cuDNN, and TensorRT software libraries for deep learning, computer vision, GPU computing, multimedia processing, and much more. It’s also supported by the NVIDIA DeepStream SDK, which delivers a complete toolkit for real-time situational awareness through intelligent video analytics (IVA) . This helps you boost performance and accelerate software development, while reducing development cost and effort.